There’s nothing new about the morality of banks and bankers coming into question, but it’s not every day the banking sector attracts criticism from a former Archbishop of Canterbury. 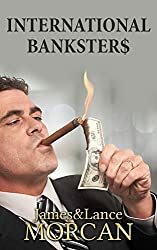 In our book INTERNATIONAL BANKSTER$: The Global Banking Elite Exposed and the Case for Restructuring Capitalism, we draw attention to what former Archbishop George Carey has to say about this highly lucrative sector. In a Daily Mail article dated June 29, 2012, one George Carey, former Archbishop of Canterbury, delivered a damning critique of the banking sector – a sector he describes as “an important part of the network of institutions which build a civil society”. Former Archbishop Carey writes, “Thus evidence of corruption in our banks, and the resulting collapse of public trust in them, affects our very democracy. “It is not an exaggeration to say that the sort of widespread alienation we are now witnessing among the public towards these multi-billion-pound behemoths can lead to civil unrest. “Why? Because in more and more cases, naked greed seems to have been the driving force for many self-serving individuals in these institutions. “That said, the real crisis we are facing is not a financial but a moral one. And it is a direct result of the something-for-nothing culture which is poisoning our society”. Carey continues, “It seems utterly wrong that, at a time when banks have been rescued by the public purse to the tune of billions of pounds, they continue to dole out huge bonuses to their executives. “To add insult to injury, they stand accused of refusing to lend to home-buyers and small businesses, thus causing even greater frustration and hardship for the hard-pressed man and woman in the street. “Are they contrite? Hardly. All we see are greedy traders at Barclays systematically rigging interest rates to make their fortunes. And this comes just days after computer glitches at Nat West which left thousands of customers in uncertainty and financial trouble. “It is hard not to conclude that institutionalised corruption is rife throughout today’s banking industry…What is needed now is a determination to open up the banking industry to a proper public inquiry”. Archbishop Carey concludes, “Criminal charges must be brought where there is serious malpractice and corruption. This would only be a start, but at least it would begin to restore the public’s faith in institutions which seem far more interested in profits than morals”.